Took my oldest for her first archery trip. I'll post this here instead of archery as we are using a crossbow and imho it's about like using a short range rifle. Definitely nothing like bow hunting other than the fact they both shoot arrows... My oldest really wants a compound bow though so I'll also ask here for suggestions on a youth setup that can still be capable to take deer. On to our trip. My oldest is my lone Tom boy of my 3 girls and I've shared some stories here on her ability to out fish her old man on occasion which really makes me proud. I cherish our time in the water together and was pretty stoked when she said she was ready to go hunt with me. Although my xbow is a bit big for her, it really is a point and shoot affair, and she's a pretty darn good shot. Under my supervision and with cocking and loading I felt pretty good we could get it done. Recently I had a neighbor offer up about 80 acres of private land to hunt to boot. It's really a blessing and it's only 35 min from my house so just about perfect. I went out Saturday and scouted things out. We weren't 10 yards from the house in his gator when we jumped 3 big does who ran away from us. A good sign so far. We turned around and decided I'd walk all my stuff in to not further spook anything as I wanted to hunt the evening. So next morning we get up early and get layered up. Get to the blind around 545 and we saw 8 deer on the way in, including a yearling who played frogger with us and about got run over lol. Now my kiddos not a stranger to the woods but this was her first real sit. Was funny to see her react to all the sounds in the dark and the tree rats provided plenty of noise to keep her alert. It started a light rain around 7 which stopped by 730. We'd heard some movement behind us which I'm fairly certain was a deer but never saw them. Then I hear a crashing though the woods. Startled my kiddo and myself a bit too as a big doe was literally running full out straight towards us in the blind. She caught either my daughters head jerk or me moving and at about 10 yards she skids to a halt. She stares us down then bolts off to the right. Was a very cool experience, but we def got busted lol. A good lesson for both of us that quick motion will get ya busted for sure. Around 9 or so we took a break and got up to stretch. My blind was not in the best of spots and the hills here are very steep and we could hear stuff, but then they'd be right on top of us when they came over the ridge. I decided we'd move down to the bottom of a hollar where a creek bed and trail made a nice 4 way intersection. I spent the walk there teaching my kiddo how to move quietly through the leaves and we were almost to the spot to stop when she sees 2 deer at the top of the hill. She saw them before I did and I finally picked them up as we quietly put our stuff down and crouched down. At this point we're pretty exposed and deer are about 80 years away. I tell her to stay put and with the rain i figured I'd see if i could stalk down to them to possibly get a shot. The brush was thick and i worked slow. I covered 40 yards in about 30min and could just make out movement in the brush. I made it about 10 more yards and then I totally lost them. They up and vanished on me. I waited about another 20 minutes then decided to go back up and get our blind and try to get setup for the evening. Kiddo did a great job of being still and quiet. She was pretty pumped watching the stalk, and amazed how I was able to close the distance without spooking them. A good teaching moment on how to be stealthy, she also decided to gopro the whole ordeal which I'm sure will be cringe worthy watching my big self stalk through the woods lol. She watched them in a stare down and after a long minute or so they decided to pop the flag and run back up the hill. She had been busted twice now but I told her that's just hunting. You're gonna see them when you're exposed and not ready, just part of it. We get blind setup and begin another sit. Saw another doe possible the same one but she skirted the hill top and never came down with range... then the weather changed and we had to call it. Had a Christmas tree waiting for her and her other sisters to decorate. Overall a great day spent with my kiddo. She is already itching to go again, and wants to start getting her own gear. I told her to bring a book in case she gets bored, but she never touched it... once again she made me a proud dad, and I feel like I got another good seed planted. An awesome hunt and she fully understands its not about the kill, that's just a minor part. 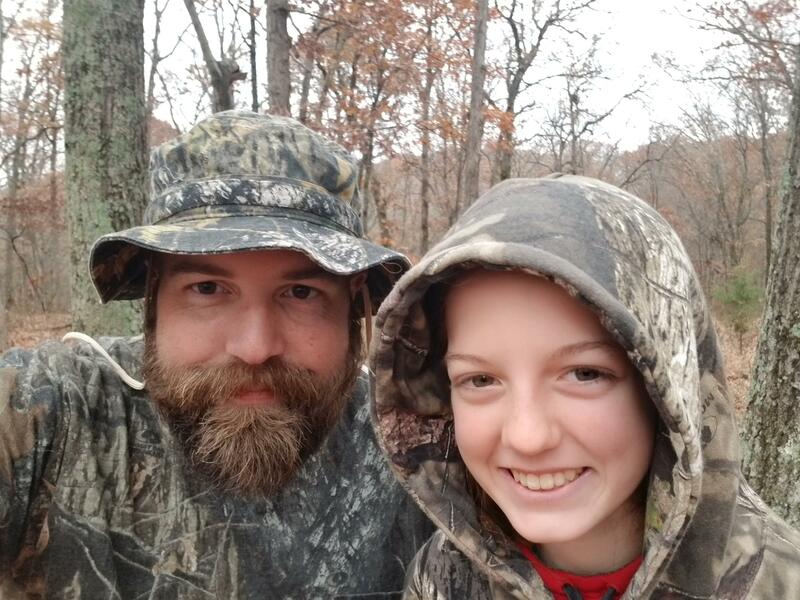 Nature is a great blessing and a day in the woods with your kid is one of the best days you can spend. Yeah buddy, I'm pretty pumped up still that she enjoyed it as much as she did. She's helped me process them before, all while my middle child the animal lover gave us dagger eyes lol. Just hope we can get a shooting opportunity at some point. Glad to hear others are planting seeds too, although I wouldnt expect anything else from the BH clan! Awesome Photo buddy! Can't wait to see her with her trophy shot of her first deer or turkey! Pat cleaned and thick sliced the heart, a sear on each side Emma ate most of it and said yummmm i like this.